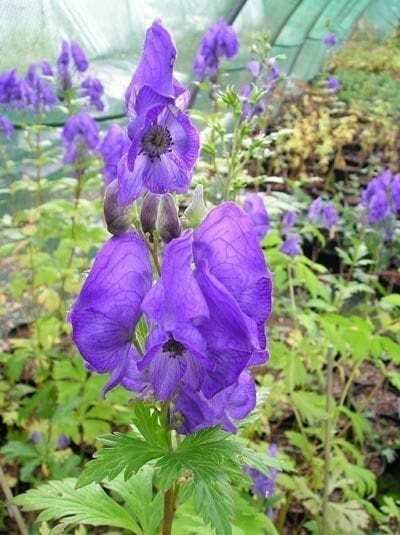 Amethyst-blue, hooded racemes of flowers, throughout autumn, which makes it a very valuable plant for extending the season’s colours. Although tall it has an erect habit and does not need staking. The leaves are glossy and dark green and are dissected. Tolerant of most soils it grows well in woodland, hedgerows or the back of shady herbaceous borders. *CAUTION toxic if eaten. Organically grown in peat free compost. Hardiness rating H7. Pot size 9cm-1.5L. Tidy old foliage in early spring just as the new growth appears. Divide at this time and add some compost to enrich the soil.